Iran is facing growing domestic and international pressure as US sanctions on oil exports are about to take effect amid increasingly visible public discontent with the ruling elite. Since last December, waves of strikes and protests have hit the country, while the Iranian government has struggled to contain the economic and political fallout of the Trump administration’s withdrawal from the Joint Comprehensive Plan of Action (JCPOA). The Iran has launched a massive diplomatic campaign to gain the support of the European Union, China and Russia in dealing with the crisis and even in pressuring the US to go back to the deal. This effort, however, has not managed to rein in the sharp devaluation of the Iranian currency and the skyrocketing inflation that have left basic commodities out of reach for ordinary Iranians. Pundits in the West have often argued that in the face of US hostility, Iranians would rally around the Islamic Republic and empower the hardliners. However, as the US withdrawal from the JCPOA is taking its toll on the economy, Iranians are blaming their leaders rather than rallying around them. The reality on the ground in Iran once more reveals the error in evaluating the complexity of what is unfolding through the prism of moderates vs hardliners. What is lost on many pundits and political forces is that, despite maintaining the appearance of a democratic alternative, Iranian Reformists have not been able to bring any tangible positive change for the past two decades. 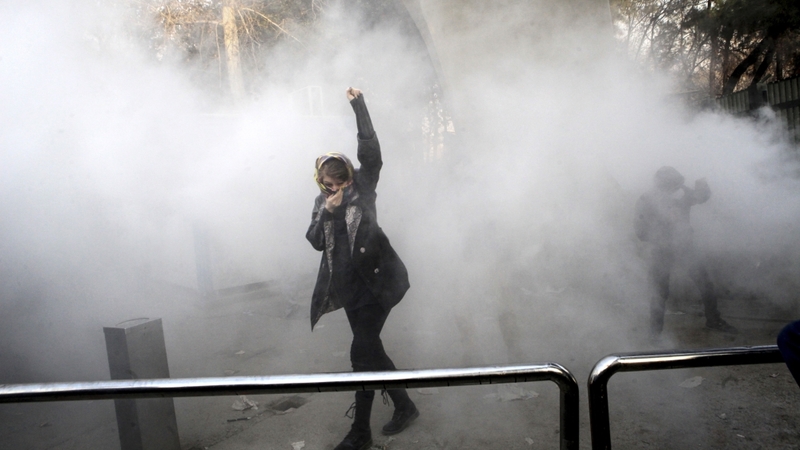 Their mission, by definition, was to ensure the Islamic Republic endured through minor modifications, or “reforms” if you will, but the recent wave of protest indicates they have reached the end of their limited and fragile existence. There is also no indication that the Reformists can rebuild public trust in the regime – because they have chosen not to take the side of the Iranian people. Various Reformist figures have made disparaging remarks about the demonstrations, including Massoumeh Ebtekar, Iran’s vice president for women’s affairs, who said protesters were being directed by outside forces; Reformist leader Abbas Abdi, who called protests “uncalculated and irrational”; and the Association of Combatant Clerics, a group led by former Reformist President Mohammad Khatami, who claimed “opportunists and troublemakers have exploited” them. It is clear that the Reformists have failed to see the breadth and depth of public discontent. Whereas the Green Movement of 2009, the last uprising of comparable scale, was largely an urban middle-class uprising, the current wave is more diverse and extends to both urban and rural areas. One of the major reasons for this diversity is that the economic crisis has affected all segments if Iranian society (except of course the ruling elite). When, in 2015, the Obama administration lifted some sanctions as part of the JCPOA, Iranians had grand hopes for economic prosperity. After all, the majority of them had voted President Hassan Rouhani into power to help negotiate the deal. Yet, the economic growth that lifting of the sanctions produced did not trickle down: The political and military elite remained the sole beneficiaries of it. As a result, public anger accumulated over time and eventually sparked a wave of protests in December 2017, which spread to some 100 cities across the country. Particularly scourging for Iran’s hardliner political elite was that the “Mostaz’afan” (the dispossessed class) who are the Islamic revolution’s claimed base, have been at the heart of these protests. Simultaneously, however, the middle class, the Reformist political base, also has taken to the streets, deeply disappointed and angered by the government’s failure to deliver not only on the economic front but also on promises for more civil liberties. The convergence between these two large socioeconomic segments is probably the most dangerous development for the Islamic Republic this year. It appears that it can no longer play the two groups against each other, nor is it capable of keeping them content through symbolic political divisions between hardliners and Reformists. The latter have clearly demonstrated that their political project no longer has any legitimacy as a viable pro-democratic alternative. What effect this cross-sectional public anger will have on the Iranian regime remains to be seen. It is not the first time the Islamic Republic faces an existential crisis and in the past it has managed to emerge from it using a mix of coercion and increased social provision spending. Time will tell whether it will weather this crisis as well. Until the outbreak of protests in December 2017, Iran portrayed an image of itself as one of the most stable countries of the Middle East. One can’t help but draw a comparison to January 1978, the year before the outbreak of the Islamic Revolution, when Jimmy Carter raised a glass to the Shah and called Iran “an island of stability”. If history has taught us anything, it is the unpredictability of Iranian politics and the fact that the political reality of modern Iran is by no means fixed – rather it is fluid and capable of giving birth to realities unforeseen by stakeholders. Nevertheless, the fact remains that the Reformist movement no longer has legitimacy as a viable democratic alternative.